Summerland horseback riding center was created on 2005 in Kastraki area. The main idea is to provide an alternative holiday plan so that guest can get to know the island via horseback riding, a truly unforgettable experience. Summerland horseback riding center gives the possibility to children and beginners to enjoy and learn about horses. 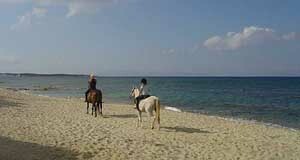 The stable is located on the way to Mikri Vigla beach, 400m from Aghia Paraskevi chapel. Ponies for young children as well as horses for both beginners and experts are available. Teacher and trip leaders help you enjoy the areas. All the equipment is brand new and very helpful. Enjoy with us and organize the program you like.